Suprasellar arachnoid cysts are uncommon lesions the optimal management of which is still subject for debate. Various authors have presented differing treatment preferences which include: 1) Subfrontal fenestration of the cyst to the basal cisterns; 2) Transcallosal fenestration of the cyst into the lateral ventricles with optional shunting; 3) Cystoperitoneal shunt; 4) Percutaneous ventriculocystostomy. There is a significant incidence of re-operation whatever the initial approach. Based on recent experience with 5 operative cases of suprasellar arachnoid cyst and a selective review of 6 major operative series covering 42 cases, the available surgical options are critically analyzed. Percutaneous ventriculostomy may offer the best chance for a definitive treatment. However the technique is demanding and is not readily available. Cystoperitoneal shunting entails shunt dependency and has a significant incidence of failure, as does cyst marsupialization to the subarachnoid cisterns. 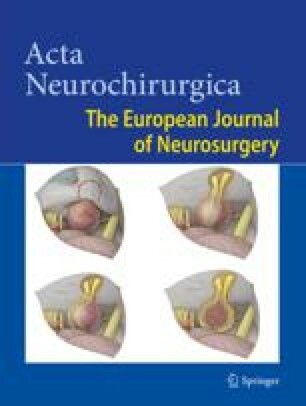 The establishment of a single CSF space by surgically communicating the cyst with the ventricular system appears to offer the best chance of success in the treatment of suprasellar arachnoid cysts, though a concomittant shunt may still be required in the occasional hydrocephalic patient.